Out of all the components of Facebook gambling capabilities, sports betting has yet to catch up to the others. Sports betting is one of the most lucrative industries worldwide, but the international market has not been able to successfully integrate it. Facebook CEO Mark Zuckerberg has stated that running sports betting through Facebook would be difficult due to age verification that would be necessary under federal law. There are other options for legal sports betting for bettors, including licensed offshore sportsbooks. While it is possible for Facebook to one day host some type of sports betting platform, the current situation encourages the use of licensed offshore sportsbooks. This page contains information regarding those sportsbooks as well as continuing coverage of some US legislation that could prove vital for the possibility of Facebook sportsbooks in America. The following table comprises the best available offshore sportsbook apps. These brands have been vetted by our team of online gambling experts and possess the necessary licensing and regulation to establish them as legal options. As web-based apps, these sportsbooks are compatible with most smartphone and tablet providers, including iPhone, Android, Windows and Blackberry. The apps are accessed through your mobile device’s browser. With betting lines from around the world and wagering types to accommodate betting styles, our recommended sportsbook brands have everything you need to start placing wagers safely. Not to mention bonuses and other promotions that award you more money to bet with at no additional cost. You can browse through the sportsbook apps by clicking on the links associated with each brand in the table. Are There Any International Facebook Sports Betting App Options? In early 2017, Onionsack, a bet messaging platform provider, developed a chat system that utilizes Facebook Messenger. This system allows punters to place bets directly through the Facebook app. Paddy Power is the first bookmaker to go live with the innovative platform. Customers can login to their accounts, check their balances and place wagers all through the Facebook Messenger app. Paddy Power has integrated their videos, blogs and podcasts into the platform to heighten the overall experience. Onionsack’s messaging platform is used by several betting brands throughout UK and Ireland. These brands include Paddy Power, Ladbrokes, William Hill and Tote UK/Betfred. This platform is a possible marker for what is come regarding the Facebook sports betting market, but so far Paddy Power is the only service to jump on the bandwagon. 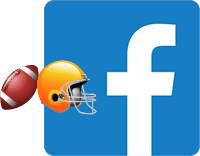 Why Are There No Facebook Sports Betting Options In The US? There are 2 major federal laws regarding sports betting in the US—PASPA and the Federal Wire Act. PASPA, or the Professional and Amateur Sports Protection Act, bans brick-and-mortar sports betting in 46 states. New Jersey, Delaware, Montana and Oregon are the only exceptions. The Federal Wire Act is a law passed back in 1961 originally blocked sports wagers transmitted through wire communication. The United States DOJ released a Formal Memorandum in 2011 that deemed the law applies to placing wagers through US-based sports betting. With Facebook, the Federal Wire Act is the applicable law and creates a problem for the social media platform. The legally sanctioned offshore sportsbook options recommended on this page are exempt from US federal laws, so American bettors are not in violation by betting with them. Is It Possible For Facebook Gambling To Exist One Day? In order for Facebook to have any chance of hosting sports betting apps, both PASPA and the Federal Wire Act would have to be repealed. This may happen soon, as New Jersey is locked in a fierce legal battle with the major professional sports leagues in the Supreme Court of the United States. If SCOTUS rules in favor New Jersey and allows them to host sports betting, other states will begin pushing pro-sports gambling legislation. International markets have the same problem. Countries with strict gambling laws will not be able to support Facebook sports betting apps or facebook casino and poker apps. More lenient counties like the UK and Ireland have launched a Facebook Messenger service through Paddy Power, and the market is likely to flesh out from there. This process still requires gambling providers to get on the same page as Facebook and clarify any gambling laws that could stand in the way. Some members of US Congress do not want to wait and see how the NJ case will pan out. A bill known as the Gaming Accountability and Modernization Enhancement Act is currently floating around in Congress. The bill calls for the immediate repeal of PASPA and aims to give states the right to introduce legal and regulated sports betting should they choose to do so. It is unclear which will occur first—the GAME Act passing or the NJ case being resolved—but both fronts present viable possibilities for legalized sports betting in the United States. As more states legalize sports betting, the odds for Facebook launching sports betting apps increases. Check back here for updates on the GAME Act.